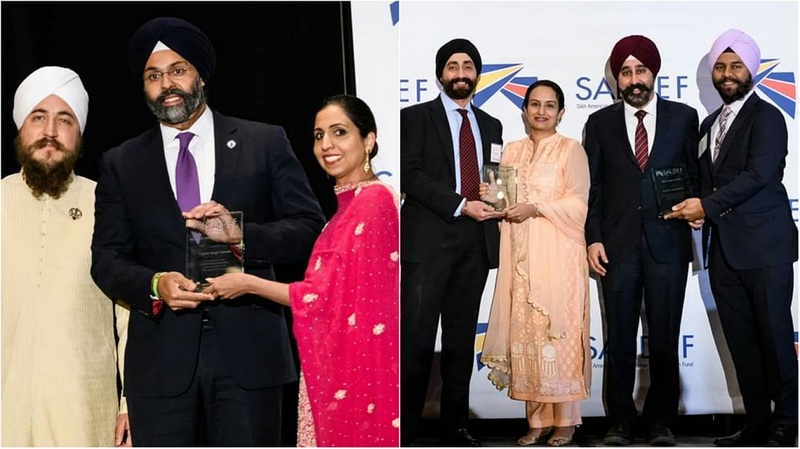 New Jersey Attorney General Gurbir Grewal (left-center) and Hoboken Mayor Ravi Bhalla and his activist wife Navneet Bindya Bhalla (right-center) were conferred with the top awards at the 2019 gala hosted by the Sikh American Legal Defense and Education Fund (SALDEF) in the Washington area. Manavi director Navneet Bindya Bhalla awarded for empowering women, championing human rights. VIENNA, VA – It was a night of awards and accolades for New Jersey’s Sikh American public servants as Attorney General Gurbir Grewal, Hoboken Mayor Ravi Bhalla and his activist wife Navneet Bindya Bhalla took center stage receiving top honors at the 2019 gala hosted by the Sikh American Legal Defense and Education Fund (SALDEF), a prominent advocacy organization now in its 23rd year. Delivering the keynote address at the annual event Saturday, Grewal, the first Sikh American attorney general in US history, spoke of his journey and the challenges he faced while remaining true to his faith. He is a turbaned Sikh, the son of Indian immigrants. “For me, there has been no better way to do that, no better way to give back, no better way to serve, no better way to stand up for others than to become a part of law enforcement. I wanted to promote an understanding through my service, to show everyone that we are part of the fabric of this country. I wanted to show that I was doing my part to keep all of us safe,” he told the audience comprising a number of lawyers and other legal experts. Grewal underscored that in every position he has held – whether as an assistant US attorney in Brooklyn, New York, later as a federal prosecutor in New Jersey, then Bergen County prosecutor, and now as attorney general – he has “been trying to promote understanding and acceptance through (his) service. Each step along the way, I have tried my level best to ensure that government advances the cause of justice for all of its residents and I have tried my best to ensure that the state treats everyone fairly, respectfully, and responsibly,” he said. Grewal’s journey exemplifies the theme of SALDEF’s 2019 gala: ‘Commitment, Hope and Renewal’. At the celebratory event, he was duly conferred with the Dalip Singh Saund public service award, named after the first Sikh American elected to Congress in 1956. A vocal critic of the Trump administration, Grewal implored members of the Sikh and other minority communities to “push back together through engagement” and begin to occupy front-line public service positions so that their children and future generations can “live in a society free from hatred and from violence” and enjoy the promise of the American dream. Like Grewal, Bhalla whose full name is Ravinder Singh Bhalla is a trailblazer — the first Sikh elected Mayor in New Jersey who proudly dons his articles of faith including the turban. And like the attorney general, his close friend, he urges the community to get involved and make a meaningful impact. “The lesson we need to impart is that the time has come in this country to get off the sidewalk and do something, raise your hand and try to make a difference in your community,” Bhalla told the audience at the SALDEF gala. “People are ready in this country and care a lot about your ability to deliver on the things that they care about,” he said mentioning issues such as healthcare, the environment and fiscal responsibility. “I can tell you that I am living proof that the sky is the limit,” he said. When he first decided to run for office in 2009, it was for an at-large seat on the Hoboken City Council and he recalled being asked how many Sikhs reside in the city. Bhalla told the gala audience that he mentioned his family, evoking much laughter. “The answer was not many Indians or South Asians live in Hoboken,” he said. People wondered about his base, who would vote for him? “I didn’t know the answer to that question, but what I did know is that I had faith in the American dream. I had faith that if you work hard in this country… you have a chance to rise,” he said. Bhalla worked very hard. There were 12 candidates running for a seat on the city council and he secured the highest number of votes. Some eight years later, he decided to run for Mayor of Hoboken “which was another challenge,” he noted referring to the naysayers. “Again I wondered is my identity as a Sikh going to be a liability to serve,” he said. Fortunately for him, “history repeated itself.” He worked hard, long hours, knocking on every door in Hoboken. In November 2017, he was elected Hoboken’s 39th Mayor out of a field of six candidates. Now, in his second year as Mayor, he is making decisions that impact thousands of people on a daily basis. “It is empowering that society sees a Sikh making these decisions on behalf of the larger community of people,” he said at the gala. Recalling one of his interactions with second-grade school children, he noted their heartfelt gratitude instead of associating him with a terrorist on account of his appearance. “They connected me with the image of a Sikh American, someone who is respectable. That is a game-changer,” he said. “I was born and raised in New Jersey. I got picked on, bullied as a second-grader. It is just refreshing to know that when I drop my kids to school,” his son does not have to face what he endured, Bhalla told the audience. He credited his wife for his success. “She is really my secret weapon,” he said. Both were conferred with the ‘Sikh Image Award’ at the SALDEF gala. “We all know that the epidemic of gender-based violence transcends all racial, ethnic and socio-economic boundaries and impacts all communities,” she said at the gala event. Referring to “a gender bias that needs to be addressed within our own community,” she attributed it to “cultural norms, deep-rooted patriarchy and how gender roles are defined. That is why it is absolutely imperative that men in our community are equally engaged to speak out and address gender bias and inequality,” she said to applause from the audience. “At Manavi, we are acutely aware of the struggles and challenges faced by South Asian survivors. A domestic violence survivor must not fear being judged, isolated, stigmatized, labeled as unstable or fear that they won’t be believed,” Bindya said. She noted that “Over the past 34 years, Manavi has done extensive work to empower women and to raise awareness about gender-based violence in the South Asian community. We strive to address both the immediate needs of women facing violence as well as the long-term vision of establishing communities free from gender-based violence because we know that violence at home doesn’t just impact individuals and families, it devastates entire communities,” she said. Among the valuable services provided by the organization is access to a transitional home called ‘Ashiana’ which enables women and children to build socially and financially viable lives in a safe and welcoming environment. “Ashiana is the only culturally-specific housing available on the east coast to South Asian women and only the third such home in the entire country,” Bindya revealed. She spoke of a multi-faceted approach to empowering survivors which includes changing how communities think and work, changing laws and policies and making sure they are implemented. “But, most importantly, we need to invest in social justice and advocacy organizations like SALDEF and women’s rights organizations so we can continue to do the work we do,” she said. Bindya underscored that her work at Manavi is informed by her Sikh values. “Human rights and social justice form a cornerstone of the Sikh faith,” she noted. “Practicing the core principles of Sikhism contribute to the achievement of social justice. The term ‘Sarbat da bhala’ means standing up for every single person in all diverse communities. The concept of ‘seva’ encourages Sikhs to do selfless service for the well-being of all including those who may not belong to the Sikh community,” she said. Bindya told the audience that she is often asked how she and her husband can “juggle various roles and make it work”? Her response is, “We share the same Sikh values and recognize the importance of supporting each other. I couldn’t be more proud of my husband and better half, Ravi, and our two children, Arza and Shabegh, who have been actively engaged with us every step of the way,” she said. “We have knocked on every door in Hoboken,” she recalled with the kids being in the forefront of both their private and public lives. “They appreciate the importance of civic engagement and have been through all the ups and downs alongside us,” Bindya said. “The pride they feel as young Sikh kids every time they see their father, the Mayor of Hoboken…. is something that words cannot describe,” she added. In a gripping speech, Kirandeep Kaur, 21, of Jackson, Mississippi, spoke of three Sikhs who were murdered in the state in the last five years – heinous crimes which were not investigated by local law enforcement. She recounted how Satnam Singh, community relations manager at SALDEF, went to Mississippi to host a ‘Know your Rights’ forum, connecting the local ‘sangat’ (congregation) to resources available. Such efforts resulted in much-needed answers, underscoring the importance of community and connectedness throughout the nation. The gala began on an entertaining note with artiste Ishmeet Narula singing Sufi, Punjabi folk and Bollywood songs. ITVGold anchor Aditi Lamba served as the mistress of ceremony.